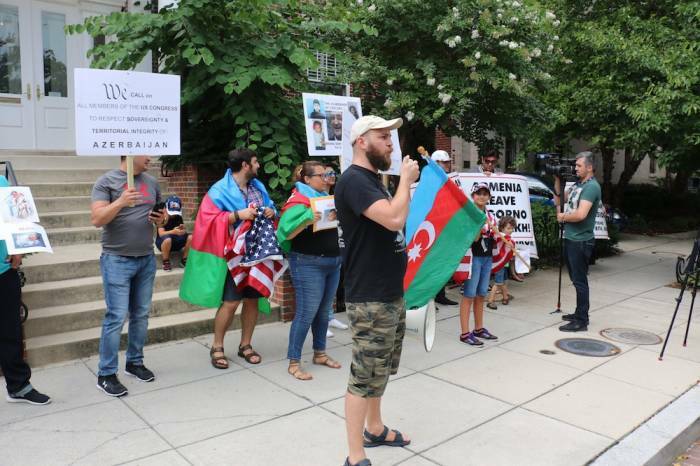 On July 7, US Azerbaijanis Network held protest action outside the Armenian Embassy in Washington, US raising an objection to shelling of the Alkhanli village of Azerbaijan’s Fuzuli district by the Armenian Armed Forces and killing Sahibe Allahverdiyeva and her 2-year-old granddaughter Zahra Guliyeva, AzVision.az reports. 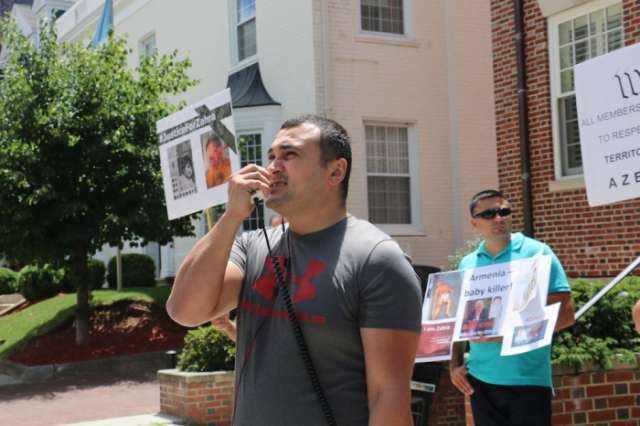 The representatives of Azerbaijani community living in Washington attended the action. 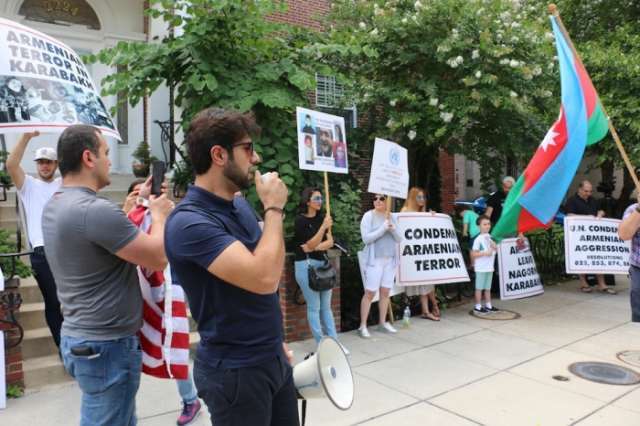 Protesters showed the facts on killing of 2 civilians as a result of Armenian shelling in Alkhanli village of Fuzuli region, as well as, Armenian aggression and its deliberately pursued ethnic cleansing policy against Azerbaijani population of Karabakh. 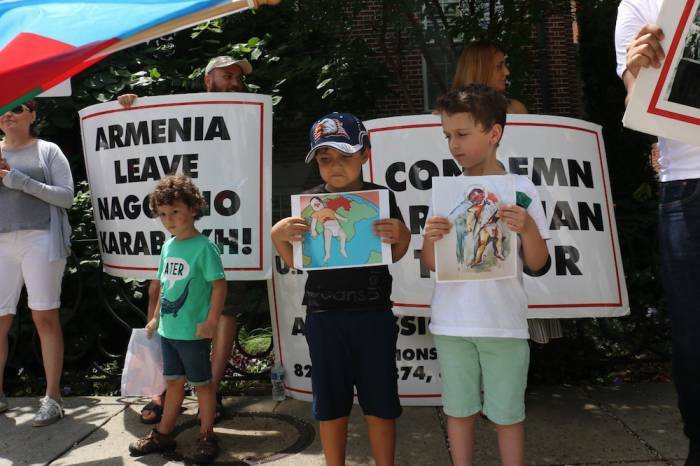 Protesters demanded the recognition of Yerevan’s occupation policy by the international community and immediate withdrawal of Armenian Armed Troops from occupied Azerbaijani territories. 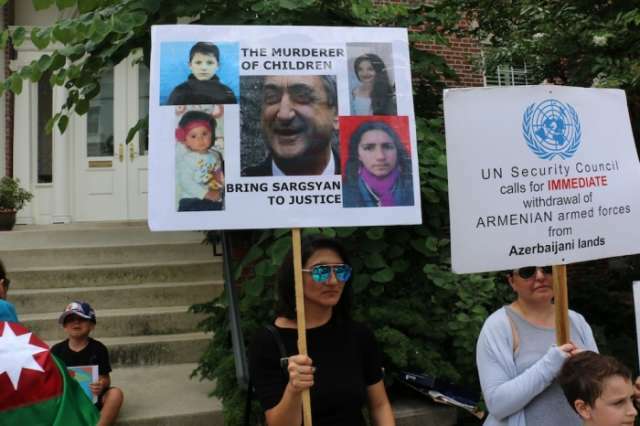 Protesters raised the photos of main perpetrators of Khojaly Genocide – the President of Armenian Republic Serzh Sargsyan, ex-president Robert Kocharyan, Armenia’s Defense Minister Seyran Ohanyan and International terrorist Monte Melkonian. Participants gave detailed information about 4 resolution of the UN Security Council and the resolutions adopted by the PACE, UN General Assembly and other international organizations. 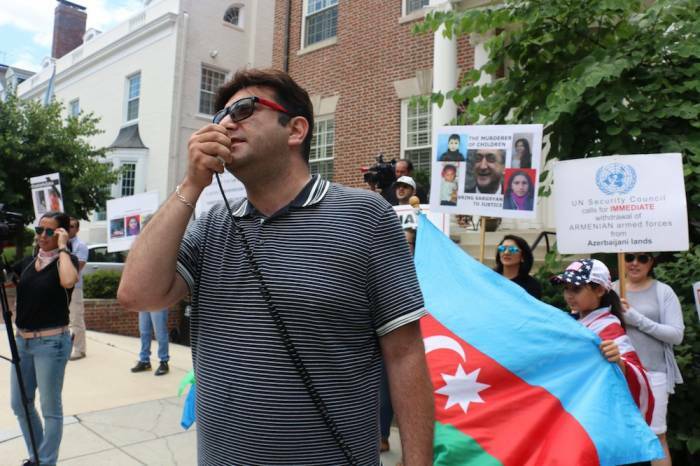 Protester shouted the slogans of “Justice for Zahra”, “Justice for Sahiba”, “Shame on your for killing of civilians”, “Armenia, get out of Azerbaijan”, “Give back our lands”, “Armenia, get out of Karabakh”, “You will be regret about occupation of Karabakh”, “Condemn Armenian terrorism”, “We remember Khojaly, Malibeyli, Gushcular and Garadaghly”, “Khojaly massacre should not be reiterated”, “Child killers”, “Armenia is a puppet country” and others. Note, On July 4, around 20.40, Armenian Armed Forces shelled Alkhanly village of Fuzuli region from mortars of 82mm and 120mm caliber, and from heavy grenade launchers. As a result of this provocation, the residents of the village of Allahverdiyeva Sahibe Idris gizi, born in 1966, and Guliyeva Zakhra Elnur gizi, born in 2016 died. Salminaz Guliyeva,born in 1965 got wounded.